Pandas is an open-source Python library which provides high-performance, easy-to-use data structures and data analysis tools for the Python programming language. Python with Pandas technology is widely used in the fields including academic and commercial domains including finance, economics, Statistics, analytics, etc. Pandas is one of the Python packages which provides fast, flexible, and expressive data structures which makes working with “relational” or “labeled” data both easy and intuitive. Python pandas online test helps recruiters and hiring managers to assess candidate’s bot development skills. Online test on Python pandas basics is created & validated by experienced industry experts to assess & hire Python pandas developers as per the industry standards. Online Python pandas test will evaluate a candidate's practical knowledge and will identify whether the candidate is ready to be employed. Python pandas assessment test can be taken by candidates from anywhere in the comfort of their time zone. Interview Mocha’s Python pandas online test has a unique set of questions. You can also create or ask us to create a customized test that includes questions that are specific to your job requirement. Our powerful reporting helps you to analyze section wise performance of candidate to gauge his strengths and weaknesses. Moreover, you can always use our candidate ranking tool to screen the best performing candidate amongst others. Python pandas skills test may contain MCQ's (Multiple Choice Questions), MAQ's (Multiple Answer Questions), Fill in the Blanks, Descriptive, Whiteboard Questions, Audio / Video Questions, LogicBox (AI-based Pseudo-Coding Platform), Coding Simulations, True or False Questions, etc. Q 1. How would you drop all rows in a dataframe - "df" which have less than 5 non-null values? Q 2. The pandas dataframe of the shown dataset is "df". Pandas is imported in your program as "pd". 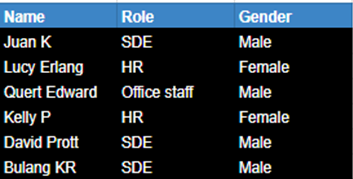 How do you obtain the count of males and females for different job roles as shown in the image below?